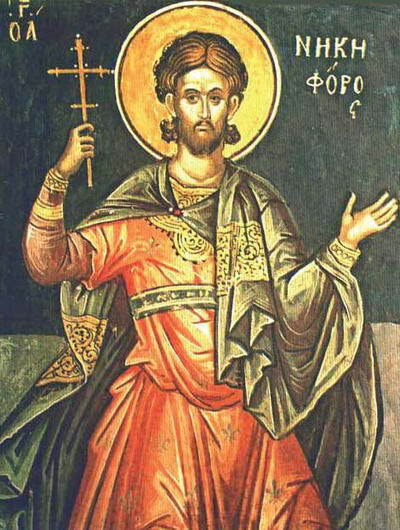 The Holy Martyr Nicephorus lived in the city of Syrian Antioch. In this city lived also the presbyter Sapricius, with whom Nicephorus was very friendly, so that they were considered as brothers. They quarreled because of some disagreement, and their former love changed into enmity and hate. After a certain time Nicephorus came to his senses, repented of his sin and more than once asked Sapricius, through mutual friends, to forgive him. Sapricius, however, did not wish to forgive him. Nicephorus then went to his former friend and fervently asked forgiveness, but Sapricius was adamant. At this time the emperors Valerian (253-259) and Gallius (260-268) began to persecute Christians, and one of the first brought before the court was the priest Sapricius. He firmly confessed himself a Christian, underwent tortures for his faith and was condemned to death by beheading with a sword. As they led Sapricius to execution, Nicephorus tearfully implored his forgiveness saying, "O martyr of Christ, forgive me if I have sinned against you in any way." The priest Sapricius remained stubborn, and even as he approached death he refused to forgive his fellow Christian. Seeing the hardness of his heart, the Lord withdrew His blessing from Sapricius, and would not let him receive the crown of martyrdom. At the last moment, he suddenly became afraid of death and agreed to offer sacrifice to idols. In vain did St Nicephorus urge Sapricius not to lose his reward through apostasy, since he already stood on the threshold of the heavenly Kingdom. St Nicephorus then said to the executioner, "I am a Christian, and I believe in our Lord Jesus Christ. Execute me in place of Sapricius." The executioners reported this to the governor. He decided to free Sapricius, and to behead Nicephorus in his place. Thus did St Nicephorus inherit the Kingdom and receive a martyr's crown. you demolished the malice of hatred. And when beheaded, you became a holy martyr for the Incarnate Savior. Pray to Him for us who praise your glorious memory in song.